Dating a woman with children can be the most fulfilling adventure a man can have. Yet, it can also be the worst experience of his life. Those who are currently seeing a woman with kids can relate to my words. However, this is only one man’s opinion, and advice. This is not a slap at this dating or relationship phenomenon, nor is it encouragement. But for those who have not experienced this rollercoaster, get ready for the ride of your life. It can leave you broken with no recovery options, or completely blissful and normal. One thing is true. The experience you will never forget. Let’s start with the woman with one child. She wants a relationship, but has not found a “good” man that will accept her and her child. Remember fellas, this is a package deal, and if she leads you to believe otherwise, RUN THE OTHER WAY!! This lady will be full of surprises, and not very good ones. She will cajole you into believing it is all about you. Instead of romantic dates, you will visit amusement parks, beaches, and other activities to include her “little one”. Now, if you are the sensitive, manly type, you will want to include the child in all you do. This shows just how much of a mate you can be to her. Yes, you will get to know this woman, and see how great a mother she can be. The romance will not blossom as fast as you may like, but, as a gentleman, you let things develop slowly. (Sound familiar?) After she feels she can talk to you, now the avalanche of “baby daddy” issues begin to arise. She bashes that man like there is no tomorrow. Now, what do you do? If you listen carefully, you may discover why “baby daddy” is not around. Depending upon what you hear, and leaving your heart out of the equation, you now must decide whether to stay or move on. A man must ask himself a number of very serious questions…Can you see yourself with this woman for the long term? Can you develop a relationship with the child? Does the child have a relationship with his/her father, and if not, why not? Does Mom appear bitter and angry when you bring up questions regarding the child’s father? Yes fellas, when you are dating a woman with one child, you are not just seeing her, but her son/daughter as well. Let’s take this one step further. You’ve met a wonderful woman, who has an incredible smile, a great heart, and you can see yourself with in a long-term relationship with her. It really does not take us very long to make that determination. But she does not have one, but two or more kids. Let’s be honest fellas, our first instinct is to RUN. We do not want the responsibility of another man’s kids, or to hear about problems and issues that are not our concern. But remember, you really like this woman, and want to know if there are long-term possibilities. This woman will not involve you right away with the kids. She is so worried about you accepting her situation; she will go out of her way to make you feel comfortable. Not to say the woman with one child will not do this, but this lady has a bit more sensitivity to the situation as a whole. You will hear the dating and Daddy stories. But, make a wise choice. If you are not comfortable with kids, do not waste your time, or hers. As soon as she sees the disingenuous interaction between you and her family, you will be out the door so fast your head will spin. Dating a woman with kids takes a man with patience, pride, and a lot of stamina. You will be ridiculed by your friends, scrutinized by her family, and be made to feel squeezed like applying for credit. But if your intentions are true, and you can work through the rough patches, it can be the most rewarding experience in your lifetime, especially if you have the chance to marry her. So, I ask her now…. Ms. Matthews, in front of the entire world - will you marry me? Friends are a valuable and key part of our existence. Friends can be there for a season, reason or a lifetime. Friends are people we show our vulnerable sides to, we share our joys and pains with, we give them classified information to hold dear to their hearts, we agree to disagree, we support each other’s endeavors and most of all we grow to love one another. There are four types of friends we need knitted around us. Some friends can be all four types or one or two types at any given time. The point is we need all classifications at one time or another. 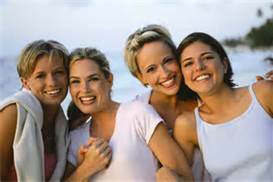 Friends are contributors to your life and add valuable substance to your friendship. The Challenger - This friend knows your strengths /weakness and will always push you beyond your limits to bring out the best in you. The Celebrator - This friend cheers you on for all your accomplishments in life and ready to celebrate them with you. Always make you feel good about yourself. The Convictor – This friend gets in your face and calls you out on the issues in your life. They give you tough love. The Counselor – This friend you can call anytime for advice. Always have an open ear to hear you and concentrate on a discerning answer for you to take away.